Prepare your Spirit for a truly LOVING Valentine’s Day! As Valentine's Day approaches, love is in the air. We spend our energies focused on giving to others – raising children, nurturing our partners , caring for aging parents – or looking for romance. Yet often we don’t give that most basic human nourishment of love to our sacred selves. Many of us assume we are open to receiving love, but often we are more defended against love than we realize– for fear of feeling too vulnerable, being disappointed, or hurt. 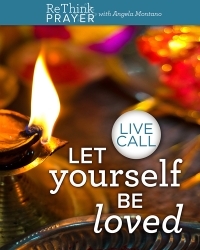 Join Angela for this profound recording of sacred insights with a step-by-step process for opening to love. 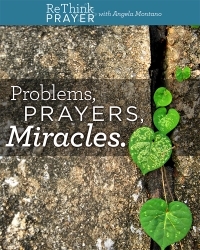 In this new weekly series—Problems, Prayers, Miracles — prayer intuitive and advocate Angela Montano, breaks down the step-by-step process of defining our problems, bringing our problems into prayer and being available for the resulting miracles. Allow Angela to be your spiritual midwife and prayer medium. In Problems, Prayers, Miracles, you will release habitual ways in which you think about your problems and learn how to be solution-oriented and miracle-minded. All the problems Angela will be working with in prayer will come from YOU. Consider this class your personal prayer laboratory and sanctuary. 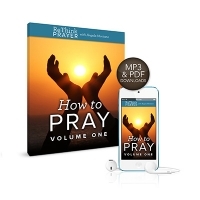 This MP3 recording provides a universal perspective on prayer that is independent of any religious affiliation. The PDF Workbook will help you create your own specific prayers, using three different types of prayer technologies – the Vulnerability Prayer, H’ooponopono and Affirmative Prayer. This program originally retailed at $129 and is now available at an over 80% discount. For a limited time, this powerful program is yours for only $14.99. 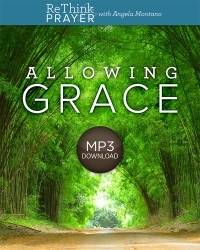 Listen in as Angela shows us stop simply rearranging the clutter of our random thoughts and instead live a life organized by a decision to allow Grace.